They wouldn’t let us into the Palace. Not to live there, at least. There must be some sort of mistake, so we’re living in a semi-detached two-bedroom place until we get it all sorted out. Mind you, the place we’ve moved to is rather nice. It has double-glazed windows while the Royal Palace has no windows at all. Sure, there is a lot more space at the palace than the house we’re in, but imagine the palace heating bill in the winter? We moved because the costs of living in Edinburgh were too taxing. 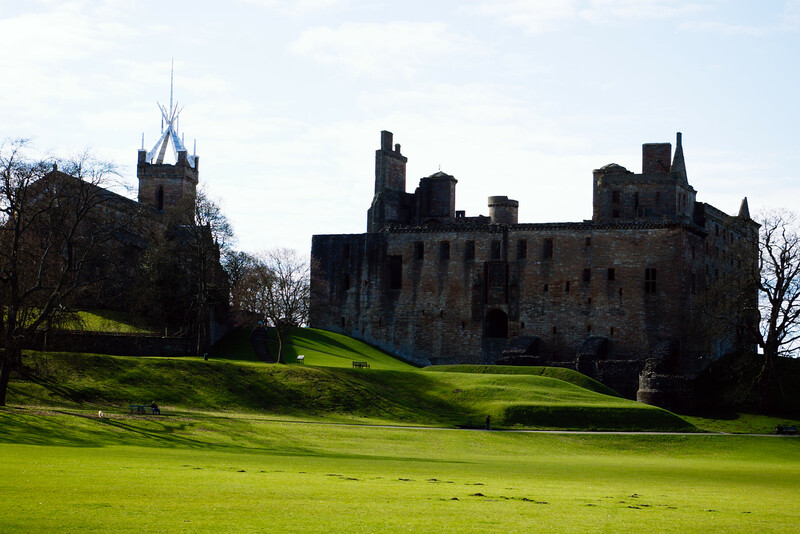 Other than the palace we should rightfully occupy, we chose Linlithgow because of its strategic geographic location. It’s about half-way between Edinburgh and Glasgow, along the railway line, increasing the markets in which we can look for employment. Nursery school teacher and telephone call centre human are not our life-long ambitions, so having a broader range of places to look for other work is an important consideration. Unlike the place we rented in Edinburgh, our new place in Linlithgow didn’t come furnished. Fortunately, second-hand furniture from charity shops (like British Heart Foundation) is super-affordable — and they deliver! Unfortunately, on the day we moved they delivered only half our bed. And not the soft, springy half. The floor that night was not in any way comfortable. Bean Dog’s emancipation from quarantine coincided beautifully with our move to Linlithgow. A few days after we moved home, it was up to me to fetch Bean from the Milton Quarantine Kennels, in Strathclyde, west of Glasgow. Angie was off at work, so I had to take Jethro with me on the journey, which complicated matters somewhat. Bean was, understandably, excited about leaving solitary confinement and getting her first sniff in six months of the outside world. Bean has neither travelled on a bus nor a train, and both means of transport would be required to get her back home. Jethro, although having travelled on buses and trains, had not travelled on them with Bean. He was rather excited about it all too. Their excitement was my trepidation. I had terrible visions of dogs and children running off in opposite directions, and falling in front of buses, trains, and other heavy machinery, as I scurried desperately after them. Surprisingly everyone was rather well behaved, with one exception. Bean sat quietly panting while every bus passenger embarked and disembarked. That was until a black person stepped on the bus. Then she let loose with her growly-yap-growl-yappity-yap! Another passenger sitting across from us remarked, “Your dog is racist.” I couldn’t really argue with her, but attempted to deflect the implication of my inherent racism with a story about dogs barking at white people in South Africa, when the dog owners were black. If seemed a flimsy defence and I’m not sure it worked. With Bean living with us again there is a sense of belonging. A sense of place. Although nothing can ever be truly permanent, we feel relatively certain that we’ll be here for a number of years to come. Our stay in Edinburgh felt transient and incomplete. A rented flat we were not allowed to decorate didn’t feel like home. We are living in a home now, and that’s an important step on getting our life back on track. Having a home gives us a base to operate from. We’ve found Jethro a playgroup to attend and a child-carer to watch over him while we attempt to rekindle our careers. Although “rekindle” may be a poor turn of phrase, considering we already cast our careers into the bonfire of [clever metaphor I’m too lazy to think of], and scattered the ashes to the four winds. Moving on to some pics of the new place. Enjoy! A home needs a painting. Great to see photos of the new pad and Libre Beandog, too… thanks for getting them up.